How do I set up conditional logic rules? How conditional logic rules work on your forms in Fulcrum. Fulcrum allows you to set up conditional logic rules on fields in your surveys based on your collection requirements. This means you can dynamically show or hide fields or sections based on values entered in specific fields. You can set a condition on any field or section. 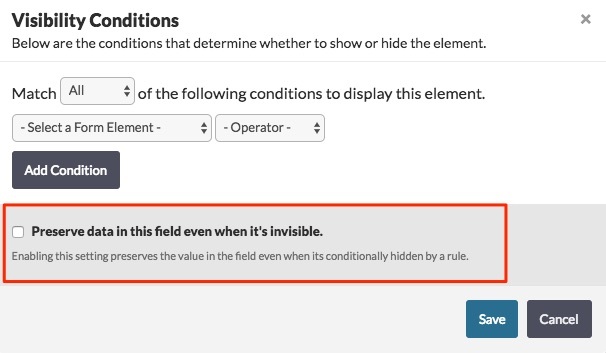 Conditional rules can be set up for both visibility or requirement of a field. NOTE: By default, when fields are hidden with visibility logic the system sees the values entered into these fields as not being valid. As a result, any value that is in that is in a hidden field will be cleared when the record is saved. If you wish to maintain the data that is entered into a field that is then hidden due to visibility logic, you will want to enable the 'preserve data in this field even when it's invisible' option in the visibility logic builder. NOTE: If you have a section with "preserve data in this field even when it's invisible" enabled all fields contained within that section will have their values retained. Even if they have their own visibility rules.